"Let us swamp the Palace with letters and e-mails"
Protesters remembered the promises president Dilma Rousseff made during her campaign. Leaders taking part in today's (Jan 26) debate at the World Thematic Social Forum on alterations to the Forest Law were unanimous in declaring that only a strong mobilisation of Brazilian society can prevent the retrograde measures set out in the text approved by Congress from being sanctioned by the President and becoming law. "Now is the time to act! Let go onto the streets and swamp the presidential palace with letters and e-mails to force President Dilma Rousseff honour her commitments, if not to us, then to future generations", declared João Pedro Stédile, coordinator of the Landless Rural Labourers' Movement and the Via Campesina. "The proposed changes are designed to facilitate the private appropriation of our biodiversity, because they grant amnesty to all past aggressions and clear the way for new waves of deforestation", he added. Former senator and environment minister, Marina Silva, followed the same line as Stédile. "Surveys show that 80% of the population does not want these changes to the Law but surprisingly, 80% of the parliamentarians have voted in precisely the opposite direction. The president made a commitment to prevent any amnesty for illegal deforestation and any projects that might stimulate more deforestation and she signed it in her own hand. If there is a strong mobilization of the people she will feel she has the backing she needs to apply the veto", insisted Marina Silva. Padre Ari Antônio dos Reis, representative of the National Confederation of Brazilian Bishops argued that the debate on Forest Law issues should be based on ethics and aimed at guaranteeing the quality of life for the next generations, and not on immediatist economic interests. "There is a huge gap separating what the Congress thinks from what civil society thinks", he regretted. WWF-Brazil CEO Maria Cecília Wey de Brito reminded those present that the social movement did its best to improve the text during the time it was being discussed in Congress but it was obvious that no space was being allowed for that. "The draft bill was drawn up in the shadowy corners of the Congress and the contributions of the scientific community and the social movement were entirely ignored", she said. WWF-Brazil's CEO classified as 'fallacious' the argument put forward by the Federal Government and the 'ruralista' parliamentary group (defenders of agribusiness and large landholder interests) that the draft bill represented the best possible agreement for Brazil's interest. "We cannot accept this discussion of what agreement is 'possible' or not possible. It is not good enough to discuss whether it is better to push the forests off the25th floor or the 10th floor, in either case they will die. We need to press hard for a veto; President Dilma Rousseff's credibility and that of Brazil depend on the decision she makes", pondered Maria Cecília. The debaters also stressed that this attempt to modify the current Forest law is one of a series of actions that have been unleashed to weaken environmental and social legislation in Brazil. Other points point raised were: the removal of IBAMA's powers to combat deforestation, alterations made to the National Protected Areas System, proposals to alter the laws regulating mining activities and the weakening of criteria for demarcating indigenous lands. "They want to do away with all the progressive measure embedded in the 1988 Constitution, that is the Ruralista's great project", declared Greenpeaces's Nilo d'Ávila. 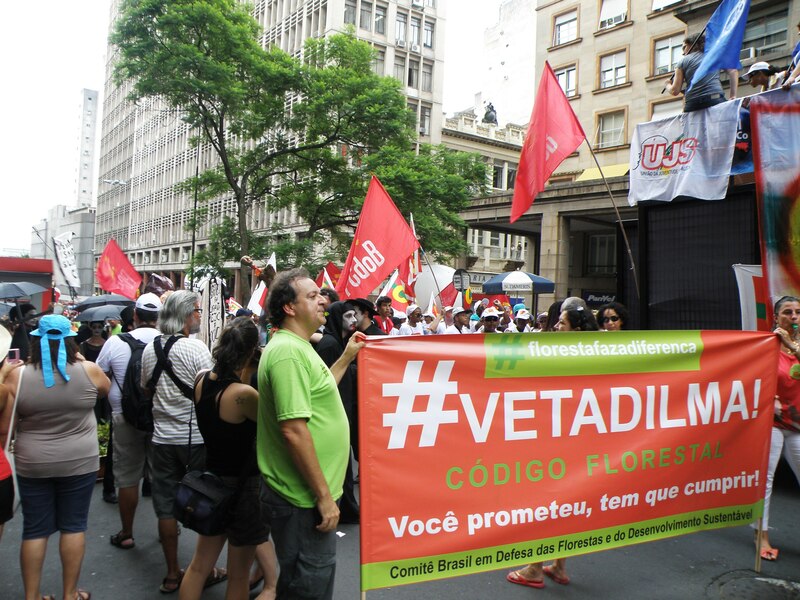 Federal Representative for São Paulo Ivan Valente (PSOL) stated that family-based agriculture, which is the country's main producer of domestic food supply, has been entirely left out of the draft bill. "The Brazil that Agribusiness wants to see is a Brazil that concentrates income and land tenure and only produces benefits for soybean exporters", he insisted. University student Rodolfo Mohr, member of the opposition to the current group in control of the National Students Union (UNE) declared that Brazilian students are prepared to go into the streets and call on the President of the Republic to veto the provisions that stimulate deforestation and grant amnesty for environmental crimes. "We have seen recent governments systematically betraying the promises they made to the people during their election campaigns of 2002, 2006 e 2010, and all because of deals they made with bankers and big Agribusiness. Only strong pressure will make President Dilma keep her promises", the student leader concluded. So let us swamp the presidential palace with letters and e-mails as João Pedro Stédile said. Visit the site http://bit.ly/sp9jre and take part in the "Veto Dilma" campaign.